Greetings programmers! It’s Andy Gesner and the staff from HIP Video Promo, proud to be bringing you a rare clip from one of the world’s biggest bands. So you say Pearl Jam doesn’t make videos? Think again. The storied Seattle quintet are back with a brand new set of bracing, inspiring, and emotionally-forthright rock songs — and this time, they’ve paired their ferocious lead single with an equally energetic promotional spot. Nothing fancy, mind you, or damaging to the band’s legendary integrity: the video for “The Fixer”, Pearl Jam’s first single from their forthcoming album, Backspacer, is a straightforward performance clip shot at the legendary Seattle club, The Showbox. But as countless fans will tell you, Pearl Jam in concert is in itself a special effect. If any band on earth needs no introduction, it’s Pearl Jam, but we’ll go ahead and provide one anyway. The band’s debut helped turn pop music upside down and demonstrated the mass appeal of alternative music; subsequent releases have proven nearly as popular and every bit as seminal. Frontman Eddie Vedder possesses one of the most distinctive and frequently-counterfeited voices in rock history — an impassioned, wounded growl that simultaneously communicates strength and vulnerability. Guitarists Stone Gossard, Jeff Ament, and Mike McCready have scarcely been less influential: their distinctive sound and style has been copied, quite openly, by legions of imitators, some of whom have sold millions of albums themselves. Ten, Vitalogy, Yield, and the rest of the band’s studio sets are remembered — rightly — as classics, but to get the true Pearl Jam experience, you’ve got to see them live. We’re confident that when Backspacer is released on September 20th, these new additions to the catalog will also become instant staples in their live set. In concert, they’re flexible, mercurial, magisterial; every song is an adventure, and every moment is an opportunity for revelation. Eddie Vedder’s stage charisma is stupendous, and the band’s sound is undeniable. Here’s a group that has released close to a hundred “official bootlegs” of their concerts; they recognize that a Pearl Jam show is an incomparable experience, and it’s one they’ve always endeavored to share. Thus, “The Fixer” clip finds the quintet in front of an audience — it’s the band’s natural element, and they wouldn’t have it any other way. 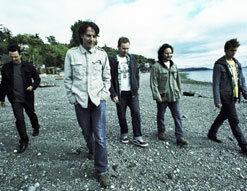 It’s also appropriate that Pearl Jam’s return to the video airwaves is directed by Cameron Crowe. The award-winning filmmaker introduced mainstream America to the Seattle sound via the Singles soundtrack; here, he reminds those who have forgotten (not that anybody has) that Pearl Jam can deliver the goods. The familiar faces are all here: Vedder, Ament, McCready, Gossard, and drummer Matt Cameron going as hard as they can, and with all the conviction they can muster. As they play, their images are reflected on video screens at the back of the hall –but so are shots of the audience. It’s a tacit acknowledgement that the band that brought crowd-surfing to America still rides on the shoulders and open arms of its adoring fans. We’re very excited to be working with the entire Pearl Jam team to bring you this most excellent new clip and we’ve got your back for all of your Pearl Jam requests. If you need more info, call Andy Gesner at 732-613-1779 or e-mail us atHIPVideo@aol.com. You can also visit www.PearlJam.com to find out more about Pearl Jam.